Cataract development is a frequent complication in patients with chronic uveitis, either as a result of chronic inflammation or secondary to steroid use., Cataract surgery in children with uveitis remains a surgical challenge. Implantation of intraocular lens (IOL) in children with uveitis is still controversial. Recent studies have revealed good outcomes in children with uveitis after posterior chamber intraocular lens (PCIOL) implantation., Pars plana vitrectomy (PPV) with pars plana lensectomy (PPL) is a preferred modality in cases with presence of cyclitic membrane or vitritis. Long-term outcome of patients in these two groups is essential to ascertain the need for IOL implantation and to know whether in the modern era of advanced surgical techniques, children with uveitic cataract could be visually rehabilitated in a better way. Hence, we report long-term outcomes of cataract surgery in children with uveitis undergoing either cataract surgery with primary IOL implantation or PPV with lensectomy without IOL. This study is, by far, the largest from North India to analyze the visual outcome and complication profile of cataract surgery in pediatric uveitis. Aphakic group: Those who underwent PPL with vitrectomy without IOL implantation. Criteria for choosing PPV with lensectomy technique over phacoaspiration with IOL implantation was based on the following factors: (a) Presence of cyclitic membrane or atrophic ciliary body on ultrasound biomicroscopy (UBM); (b) presence of vitreous membrane or opacity; (c) preoperative hypotony. Preoperative evaluation was done using slit lamp. UBM was performed in all cases of juvenile idiopathic arthritis (JIA) to rule out the presence of cyclitic membrane. In cases where posterior segment could not be visualized with direct or indirect ophthalmoscopy, posterior segment evaluation was done using ultrasonography. Standard steps of phacoaspiration with IOL implantation were followed in the pseudophakic group. Posterior synechiae were lysed with the viscoelastic cannula before capsulorhexis. Cataract surgery was performed via clear corneal incision and using a continuous curvilinear capsulorhexis of approximately 5 mm in diameter, followed by hydroprocedures and bimanual phacoaspiration and placement of a posterior chamber IOL into the capsular bag. IOL implanted was either composed of hydrophobic acrylic or polymethylmethacrylate (PMMA) material. Primary posterior capsulotomy (4–4.5 mm) with limited anterior vitrectomy was performed in all cases. Similarly, standard steps of PPV with lensectomy and surgical iridectomy were performed in the aphakic group. Subconjunctival dexamethasone (4 mg/ml) and gentamicin (20 mg/ml) was instilled in all cases at the end of the surgery. Etiology of uveitis was noted in all cases. In case of JIA with presence of cyclitic membrane on UBM, PPL and PPV in addition to cyclitic membrane dissection with silicone oil tamponade were done to avoid postoperative hypotony., Hypotony was defined as intraocular pressure (IOP) <5 mmHg for >4 weeks in the absence of glaucoma surgery. In the above-mentioned cases of JIA, IOL implantation was avoided. All children received preoperative oral and frequent topical steroids. High IOP was defined as patients with an IOP >21 mmHg or the patients who were on antiglaucoma medications, either oral or topical. Steroids were tapered off according to the clinical response in the postoperative period. In all patients, preoperative topical corticosteroid therapy was adjusted on an individual basis to obtain the minimum achievable level of inflammation in each patient (range, six times daily to hourly). Outcome measures included change in visual acuity, change in IOP, need for secondary procedures, and related postoperative complications. Preoperative visual acuity and visual acuity at last follow-up were also noted. Post surgery, children were advised spectacles in both groups. Amblyopia therapy in the form of part-time occlusion was advised whenever indicated. The main outcome measures were visual acuity and postoperative complications. Postoperatively, good outcome was defined as improvement of >2 lines in vision and/or no additional surgical intervention. Satisfactory gain was defined as improvement of up to two lines of vision and/or single secondary surgical intervention. Poor outcome was defined as ≤1 line improvement and/or multiple secondary interventions. Statistical analysis was done using SPSS statistical software V.12.0.1 (SPSS, Inc.). Wilcoxon signed-rank test was used to analyze visual outcomes within the group, and Pearson's Chi-square test and Fisher's exact test were used for intergroup variables. Mann–Whitney U-test was used to compare visual acuity. A P value of 0.05 or less was considered statistically significant. A total of 58 eyes of 37 patients (25 girls and 12 boys) were included. [Table 1] and [Table 2] show the etiological diagnosis and baseline preoperative clinical characteristics. 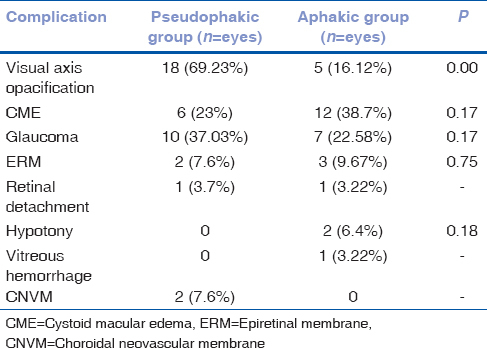 The pseudophakic group consisted of 17 patients (27 eyes; 46.55%), while 20 patients (31 eyes; 53.44%) were aphakic. 66.66% (18 eyes) of the pseudophakic group had anterior uveitis compared to 38.70% of the aphakic group (11 eyes). The mean age of children in both the groups was 10.5 ± 5.41 (SD) years (range: 3–16 years). The mean age in the pseudophakic group was 10.85 ± 4.12 years (4–16 years) and in the aphakic group it was 7.83 ± 5.09 (SD) years (3–15 years). Overall, 20 patients had bilateral cataract extractions (nine patients in the pseudophakic group and 11 in the aphakic group). JIA was the most common diagnosis with a total of 19 cases (51.35%), presumed intraocular tuberculosis 8 (21.62%) cases, idiopathic 4 (10.81%), Behçet's disease 2 (5.40%), Vogt–Koyanagi–Harada syndrome 2 (5.40%), human leukocyte antigen B-27 associated uveitis 1 (2.70%), and toxocariasis 1 (2.70%) case. A rheumatologist established the diagnosis of JIA in all cases. A positive antinuclear antibody test was found in five patients (26.31%) of JIA (three patients in the aphakic group and two patients in the pseudophakic group). [Table 1] shows the anatomical distribution of uveitis with etiological diagnosis. Etiological diagnosis in each group is based on the SUN classification. [Table 2] shows the classification of cases of each group on the basis of anatomical involvement. Anterior uveitis was the most common type of uveitis in the pseudophakic group (P = 0.033), while the aphakic group mainly constituted panuveitis cases (P = 0.036). The morphology of cataract was posterior subcapsular type in all cases. 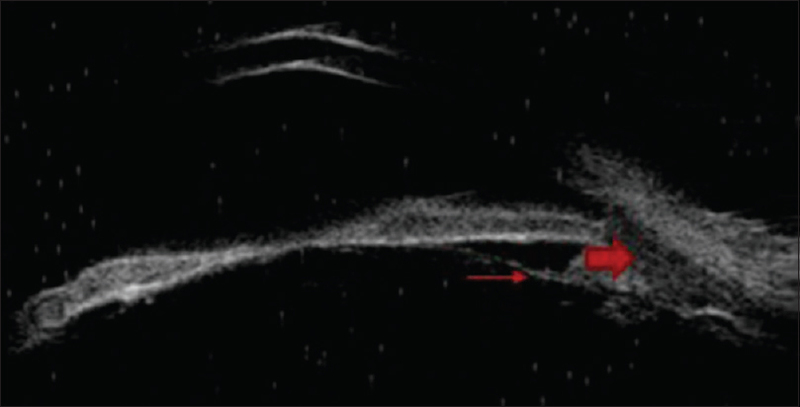 Posterior synechiae were seen in 46 eyes (79.31%) and band-shaped keratopathy (BSK) in 22 eyes (37.93%). [Table 3] shows the preoperative clinical characteristics in each group. Oral steroids (prednisolone; 1 mg/kg body weight) were given in all cases in the postoperative period. Overall, 23 cases (62.16%) were on immunosuppressive therapy in addition to systemic steroids at the time of surgery for their ocular condition. Six patients were on methotrexate (16.21%), seven on azathioprine (18.91%), and ten patients on both methotrexate and azathioprine (27.02%). Three patients (four eyes, 8.1%) received intravitreal dexamethasone implant (Ozurdex®, 0.7 mg dexamethasone, Allergan, Inc., Irvine, CA) at the time of cataract surgery along with IOL implantation. All patients in the aphakic group underwent surgical iridectomy intraoperatively, while 12 eyes (44.44%) underwent iridectomy in the pseudophakic group. The IOL material was hydrophobic acrylic in all cases (96.29%) except for one (3.70%) case in which PMMA was used. IOL was implanted in the bag in all cases. BSK removal was done in four eyes (12.9%) before surgery in the aphakic group. The combined follow-up was 3.69 years ± 7.2 SD (median 3.25 years). The mean follow-up was 3.12 years ± 4.4 (range 2.0–4.9 years) in the pseudophakic and 4.2 years ± 5.0 (SD) (range 1–10 years) in the aphakic group. In terms of improvement of CDVA, there was significant improvement in visual gain (P < 0.001) in the postoperative period with 55.17% (32 eyes) gaining more than 20/40 vision. In the pseudophakic group, BCVA of ≥20/40 was achieved in 19 eyes (70.37%), out of which 12 eyes (44.44%) had visual acuity of 20/20 [Figure 1]. 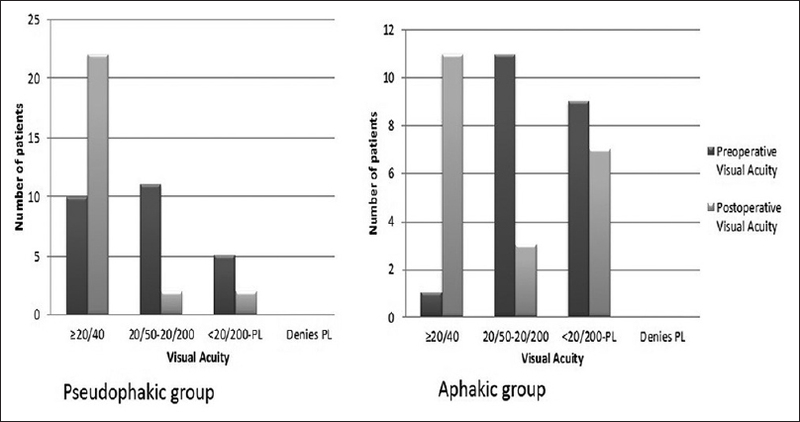 Visual acuity of ≥20/40 was achieved in 13 eyes (41.93%) of aphakic group [Figure 2] (pseudophakic P= 0.000 and aphakic P= 0.032). The pseudophakic group attained better postoperative visual acuity on last follow-up as compared with aphakic group (P = 0.003). Preoperative visual acuity could not be recorded in six children (10 eyes) as they were uncooperative. In those children, vision was assessed by pattern of fixation (whether central, steady, or maintained). All subjects cooperated for visual acuity assessment at last follow-up. Good outcome (>2 lines improvement) was seen in 38 eyes (65.51%), satisfactory outcome (up to 2 lines improvement) was seen in 14 eyes (36.84%), and poor outcome was seen in 10.34% (six eyes). Among the six eyes with poor vision gain, two patients had retinal detachment, two had choroidal neovascular membrane (CNVM), and two had hypotony in the postoperative period. Overall 17 patients developed glaucoma (10 in pseudophakic and seven in aphakic group; P= 0.06). In the pseudophakic group, two patients had preexisting glaucoma and one patient had undergone trabeculectomy 1 year before cataract surgery. The same patient required blebotomy 1 year after cataract surgery and further needed glaucoma drainage device surgery for uncontrolled IOP. One patient underwent simultaneous phacoaspiration with PCIOL and trabeculectomy (phacotrab) procedure. Six eyes from the pseudophakic group underwent trabeculectomy and four eyes underwent glaucoma drainage device surgery. In the aphakic group, one eye had preexisting glaucoma while two eyes underwent trabeculectomy and two eyes underwent glaucoma drainage device surgery. All those eyes in the aphakic group had JIA as a common etiology. There was no statistically significant difference in glaucoma surgery post cataract surgery in both the groups (P = 0.17). In the postoperative period, IOP spikes subsequently resolved over a mean period of 4.6 ± 2.2 weeks, as steroids were tapered off. The mean IOP in the pseudophakic group was 16.63 ± 5.03, and 15.72 ± 3.2 in the aphakic group at 2 weeks post surgery. The main reason for IOP spikes was attributed to ocular hypertension due to steroid responsiveness and postoperative inflammation. Another common complication noted in the pseudophakic patients was posterior capsular opacification (18 eyes, 66.66%). Out of these eyes, 11 eyes had visually significant posterior capsular opacification, seven eyes (26.92%) underwent Nd:YAG capsulotomy while four patients (14.81%) underwent surgical capsulotomy. [Table 4] describes the secondary interventions done in each group. In the aphakic group, visual axis opacification due to pupillary membrane formation was noted in five eyes (16.12%) and all underwent surgical membranectomy with pupilloplasty. 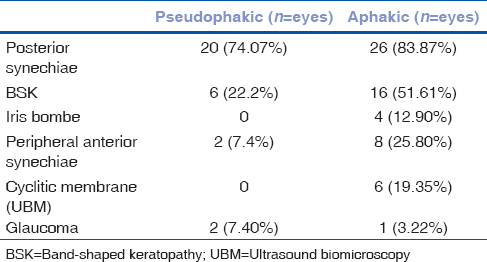 The pseudophakic eyes underwent more number of secondary procedures as compared to aphakic eyes (P = 0.01%). Cystoid macular edema was noted in six eyes (22.22%) in the pseudophakic group and in 12 eyes (38.70%) in the aphakic group. Retinal detachment occurred in one eye in each group, respectively. Both cases subsequently underwent PPV with oil tamponade. Hypotony was noted in two eyes (6.4%) of JIA after PPL and PPV, which subsequently resolved with improvement in visual acuity. [Table 5] shows the postoperative complications in each group. Cataract formation is a frequent complication in uveitis. Evidence on outcomes of cataract surgery with IOL implantation in children with JIA associated uveitis is limited. We excluded Fuchs' uveitis cases since the outcome cataract surgery is good in most of the studies., Perioperative inflammation control is essential in uveitis cases as it determines the postoperative success.,, All cases in our study had optimum control of inflammation for at least three consecutive months before surgery. Perioperative immunosuppressive therapy was given in all cases in the form of oral steroids and/or oral immunosuppressive therapy. Among the infective causes, presumed intraocular tuberculosis was the leading cause of uveitis in our study. In a study by Gautam et al., who studied the pattern of pediatric uveitis in North India, presumed ocular tuberculosis was stated to be the most common infective cause of uveitis. The distribution of cases among the groups suggested that more number of anterior uveitis cases underwent lens implantation and majority of panuveitis cases underwent lensectomy and vitrectomy. In our study, two groups of patients were analyzed, one with primary IOL implantation and the other without IOL implantation. BenEzra and Cohen reported that in young children with uveitis, IOL implantation is preferable to correction with contact lenses in those needing unilateral cataract surgery. Terrada et al., in their study with 22 eyes of 16 children of uveitis, concluded that IOL implantation was not a formal contraindication in presence of full control of inflammation. Prophylactic surgical iridectomy should be considered in patients predisposed to high IOP. In our study, iridectomy was performed in 44.4% of pseudophakic eyes and in all patients with aphakia. Although in our study there was no correlation between glaucoma and patients without surgical iridectomy, we recommend surgical iridectomy in all patients of uveitic cataract. Nemet et al. concluded that even though the JIA associated group had more severe complications in the early postoperative period compared to the non-JIA group, there was no difference in the ultimate visual outcome. In our study, JIA associated cases had good visual outcome and improvement of vision was seen in all cases. Compared to the pseudophakic eyes, the aphakic eyes had poorer visual acuity in preoperative period and presence of vitreous opacities was more in this group. Moreover, the percentage of patients with panuveitis and posterior uveitis was more in the aphakic group, and this might also be a reason for poorer visual gain in this group of patients. There was no correlation between duration of uveitis and final outcome. Cystoid macular edema was significantly less in the pseudophakic group (P = 0.03). This could be attributed to the fact that the anterior hyaloid phase was not breached in majority of these patients. Use of foldable hydrophobic acrylic IOLs and PMMA IOLs has been considered safe and effective in several studies.,, Adan et al. have reported two cases of JIA associated uveitis, both requiring IOL explanation due to persistent uveitis, cystoid macular edema (CME) and hypotony. In the present study, hypotony was noted in two cases of JIA following PPL and PPV and none in the IOL group. In our study, the number of secondary procedures required in the pseudophakic group was significantly more as compared to aphakic group which is consistent with IATS study. The most commonly performed secondary surgery was capsulotomy. Nemet et al. and Edelsten et al. reported favorable surgical outcomes in a small series of children with JIA associated uveitis after cataract surgery with PCIOLs even when combined with trabeculotomy. Ram et al. showed favorable visual outcomes in adults with uveitis undergoing cataract surgery with PCIOL implantation after control of inflammation. In the present study, significant improvement was seen in most of the cases with or without IOL implantation. Quinones et al. reported 92% improvement in visual outcomes in eyes with PMMA IOLs placed in-the-bag while Palsson et al. advocated combined phacoemulsification, IOL implantation, and vitrectomy in cases with vitreous pathologies and reported favorable visual outcomes. In our series, IOL was implanted in the bag in all cases. Studies conducted on the use of intravitreal steroid implants, e.g. Ozurdex (dexamethasone) have been reported to have favorable outcomes. In our study, intravitreal dexamethasone implant (Ozurdex®) was injected intraoperatively in three eyes in the pseudophakic group who had unilateral involvement with pars planitis. Out of the three eyes, one eye developed secondary glaucoma and glaucoma drainage device was implanted 4 months after cataract surgery. In our series, CME, preexisting macular scar, and hypotony were the major causes of poor visual outcomes in aphakic patients. Sijssens et al. evaluated the long-term ocular complications in aphakic versus pseudophakic eyes of children with JIA associated uveitis and concluded that IOL implantation in well-selected cases is not associated with increased risk of complications as compared to aphakic patients. The striking feature in our study was the incidence of secondary glaucoma being more in the pseudophakic group as compared to the aphakic group, while recent studies by Sijssens et al. and Adan et al. found IOLs neither protective nor a risk factor for secondary glaucoma. One noteworthy observation in our study is that the preoperative IOP was higher in pseudophakic group than the aphakic group. This could be the reason for greater incidence of glaucoma in the pseudophakic eyes which further mandated glaucoma surgery. In one of our departmental studies by Gautam Seth et al., glaucoma secondary to uveitis in children was studied. According to the study, pseudophakic glaucoma was more refractory to treatment and half of the cases required glaucoma surgery. Hence, we should practice caution in children with preoperative high IOPs to better prognosticate the surgical outcome. As described by Morse et al. and Gupta et al., patients of uveitis in whom ciliary membrane dissection is incomplete or in the presence of ciliary body atrophy, silicone oil tamponade helps in prevention of postoperative hypotony and phthisis bulbi. In our experience, every case of uveitis should be evaluated for risk factors such as hypotony, presence of cyclitic membrane, atrophic ciliary body, glaucoma, and vitreous opacities. The patients with the above findings should be considered for PPL and vitrectomy. The newer studies, indicate that with the advent of adequate control of inflammation and immunosuppressive therapy, IOL implantation in uveitis has good prognosis as compared to older studies in which mainly corticosteroids were used for inflammation control. Our study in the only study from North India that evaluates the outcomes as well as complication profile of cataract surgery in the pediatric population. Limitations of our study include small sample size, retrospective study, and lack of controls. Severity of inflammatory reaction is expected to be more in younger children and that may also have a role to play in the final outcome. Another limitation is the inclusion of multiple etiological causes as each etiology may have different prognosis. Because the aim of our study was to find the outcome and related complications of cataract surgery in uveitic cataract, we have included broad spectrum of cases to identify the complication profile. Multicentric collaborative studies aimed at longer follow-up over years postoperatively may reveal other complications in these children. To conclude, both lensectomy-vitrectomy and phacoaspiration with PCIOL implantation can provide good visual outcomes to some extent in children with uveitis but multiple factors such as disease chronicity, glaucoma, CNVM, and hypotony are responsible for poor outcomes. Optimum immunosuppression therapy is highly advantageous. PPV with lensectomy is associated with better visual outcomes in certain situations such as presence of cyclitic membrane, cases with vitreous opacity, and preoperative hypotony. PCIOL implantation should be avoided in the above situations. Hydrophobic acrylic IOLs are well tolerated even in JIA cases with minimal posterior segment involvement. Meticulous case selection and aggressive control of pre and postoperative intraocular inflammation are the key factors in the postoperative success of these patients. Rosenberg KD, Feuer WJ, Davis JL. Ocular complications of pediatric uveitis. Ophthalmology 2004;111:2299-306. Kanski JJ, Shun-Shin GA. Systemic uveitis syndromes in children: An analysis of 340 cases. Ophthalmology 1984;91:1247-52. Tugal-Tutkun I, Havrlikova K, Power WJ, Foster S. Changing patterns in uveitis of childhood. Ophthalmology 1996;103:375-83. Lundvall A, Zetterstrom C. Cataract extraction and intraocular lens implantation in children with uveitis. Br J Ophthalmol 2000;84:791-3. BenEzra D, Cohen E. Cataract surgery in children with chronic uveitis. Ophthalmology 2000;107:1255-60. Jabs DA, Nussenblatt RB, Rosenbaum JT, Standardization of Uveitis Nomenclature (SUN) Working Group. Standardization of nomenclature for reporting clinical data: Results of first International Workshop. Am J Ophthalmol 2005;140:509-16. Morse LS, McCuen BW. The use of silicone oil in uveitis and hypotony. Retina 1991;11:399-404. Paderson JE. Ocular hypotony. In: Ritch R, Krupin T, Shields MB, editors. The Glaucomas. 2. Mosby: St. Louis; 1996. p. 385-95. Ram J, Jain S, Pandav SS, Mangat GS. Post-operative complications in intraocular lens implantation in patients with Fuch's heterochromatic uveitis. J Cataract Refract Surg 1995;21:548-51. Ram J, Kaushik S, Brar GS, Gupta A. Phacoemulsification in patients with Fuch's heterochromatic uveitis. J Cataract Refract Surg 2002;28:1372-8. Terrada C, Julian K, Casoux N, Prieur AM, Debre M, Quartier P, et al. Cataract surgery with primary intraocular lens implantation in children with uveitis: Long term outcomes. J Cataract Refract Surg 2011;37:1977-83. Lam LA, Lowder CY, Baerveldt G, Smith SD, Traboulsi El. Surgical management of cataracts in children with juvenile rheumatoid arthritis- associated uveitis. Am J Ophthalmol 2003;135:772-8. Gautam N, Singh R, Agarwal A, Yangzes S, Dogra M, Sharma A, et al. Pattern of paediatric uveitis at a tertiary referral institute in North India. Ocul Immunol Inflamm 2018;26:379-385. Nemet AY, Raz J, Sachs D, Friling R, Neuman R, Kramer M, et al. Primary intraocular lens implantation in paediatric uveitis: A comparison of 2 populations. Arch Ophthalmic 2007;125:354-60. Adan A, Gris O, Pelegrin L, Corretger X. Explanation of intraocular lenses in children with juvenile arthritis associated uveitis. J Cataract Refract Surg 2009;35:603-5. The Infant Aphakia Treatment Study Group. Comparison of contact lens and intraocular lens correction of monocular aphakia during infancy. A randomized clinical trial of HOTV optotype acuity at age 4.5 years and clinical findings at age 5 years. JAMA Ophthalmol 2014;132:676-82. Edelsten C, Lee V, Bentley CR, Kanski JJ, Graham EM. An evaluation baseline risk factors predicting severity in juvenile idiopathic arthritis associated uveitis and other chronic uveitis in early childhood. Br J Ophthalmol 2002;86:51-6. Ram J, Gupta A, Kumar S, Kaushik S, Gupta N, Severia S. Phacoemulsification with intraocular lens implantation in patients with uveitis. J Cataract Refract Surg 2010;36:1283-88. Quinones K, Cervantes-Casteneda RA, Hynes AY, Daoud YJ, Foster CS. Outcomes of cataract surgery in children with chronic uveitis. J Cataract Refract Surg 2009;35:725-31. Palsson S, Nystrom A, Sjodell L, Jacobsson G, Byhr E, Andersson Grönlund M, et al. Combined phacoemulsification, primary intraocular lens implantation and pars plana vitrectomy in children with uveitis. Ocul Immunol Inflamm 2014;23:144-51. Sella R, Oray M, Friling R, Umar L, Tugal-Tutkun I, Kramer M. Dexamethasone intravitreal implant (Ozurdex®) for pediatric uveitis. Graefes Arch Clin Exp Ophthalmol 2015;253:1777-82. Sijssens KM, Los LI, Rothova A, Schellekens P, Does P, Stilma JS, et al. Long term ocular complications in aphakic versus pseudophakic eyes of children with juvenile idiopathic arthritis –associated uveitis. Br J Ophthalmol 2010;94:1145-9. Gautam Seth N, Yangzes S, Thattaruthody F, Singh R, Bansal R, Raj S, et al. Glaucoma secondary to uveitis in children in a tertiary care referral center. Ocul Immunol Inflamm 2018:2:1-9. Probst LE, Holland EJ. Intraocular lens implantation in patients with juvenile rheumatoid arthritis. Am J Ophthalmol 1996;122:161-70. Ganesh SK, Mistry S. Phacoemulsification with intraocular lens implantation in pediatric uveitis: A retrospective study. Ocular Immonol Inflamm 2016;26:305-12.